See the Wright Patman Lake website for additional information. Primary recreational opportunities are listed below. Directions: From Texarkana, 9 miles south on U.S. Hwy. 59. Factoid: Wright Patman Lake is located in the beautiful piney woods of northeast Texas. The lake includes about 30,000 surface acres of water and 50,000 acres of land. Numerous recreational opportunities are available including camping, boating, fishing, swimming, hiking, hunting, and wildlife viewing including wintering bald eagles, pelicans, and various migratory ducks. Local attractions include numerous festivals such as Four State Fair and Rodeo; Quadrangle Street Festival;Jump, Jive and Jam Festival in Texarkana; Forest Festival in Atlanta; and Frontier Days Festival in New Boston. 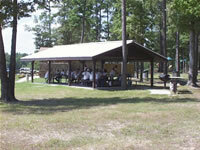 Texarkana also has numerous museums and points of interest including historic buildings and memorials.